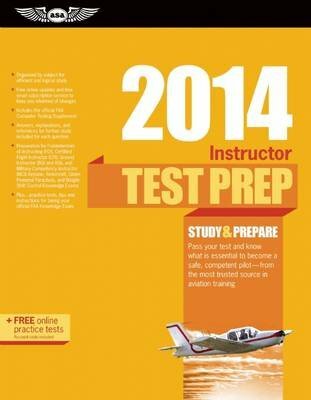 Applicants studying for the Certified Flight Instructor (CFI) Knowledge Exams will find sample questions for every question in the Federal Aviation Administration exam database along with their answers and explanations, in this guide. The more than 900 questions from the exam are arranged by subject category, with each section prefaced by text introducing the subject matter and accompanied by specific study material. Each question is followed by the answer, an explanation of the answer, and a Learning Statement Code for further study in FAA materials. Updates are provided to account for FAA test-question changes throughout the publication year via the ASA website or e-mail. Subjects covered include the fundamentals of instructing, the principles of flight, aircraft performance, weather services, en route flight and navigation, airport procedures and operations, and flight physiology.